From the beginning of the 90s a new period began in the work of Gustav Klimt. At this time, the artist felt a keen desire to go beyond the academic traditions, despite his popularity in the artistic circles of the Viennese society. In 1895, Klimt painted the picture “Love.” It is one of the works in which a cardinal change of style to modernism is clearly visible. In the new style of the artist also traced the influence of impressionism and symbolism. When you first look at the picture, it is perceived as an image of idealized happiness. Before us is a couple in love. The faces of the characters are somewhat blurred, but the artist conveys them almost with photographic accuracy. The romantic mood of the composition is added by the golden borders bordering it with delicate roses. However, on closer examination of the work, we understand that the first impression was deceptive. The author masterfully conveys the feelings and mood of the girl through her expression. The heroine of his canvases is under the power of his love. This is evidenced by her head thrown back, posture and slightly parted lips. The look of the young man is cold and suspicious. In the lilac – gray fog we see several more female images – a child, a woman and a gloomy old woman. Together, these images in the background cause not the most pleasant sensations, they more look like a fragment of a bad dream captured in a picture. Three of these figures seem to remind us of the fragility of human life, and perhaps hint at the shortness of feelings. 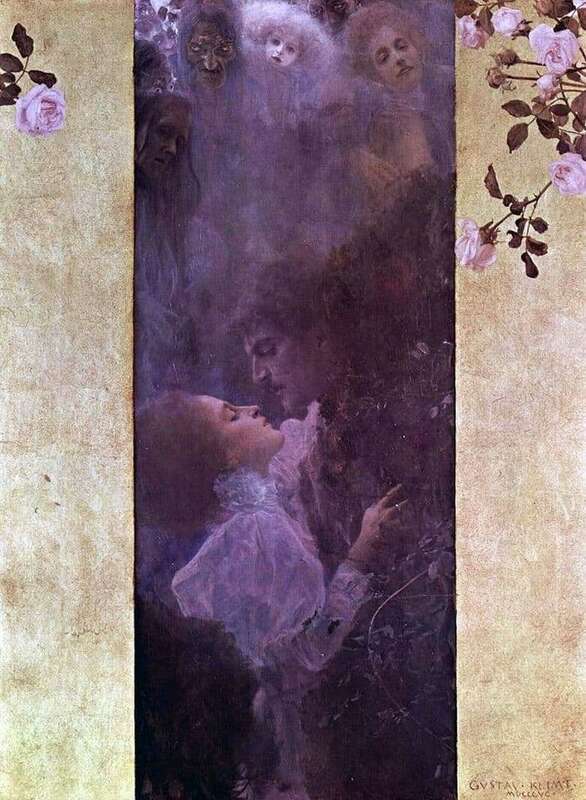 In his work, Klimt not only portrayed the beauty of love, but also put into her the idea that feelings between people are inextricably linked with death, since everything beautiful in this world ends sooner or later.